Anthropomorphic projection can bring familiarity, confidence and simplicity to our interactions with unknown agents showing a human-like resemblance or behaviour. This study examined whether this projection is generalised beyond the individual agent to encompass others of similar type, even if they might be lacking the requisite human-like features. In an experiment participants had to accept or reject recommendations from two robots that had more or less human-like forms and behaviours. It was found that participants were more likely to trust the judgements of a less-human like robot if they had previously interacted with an anthropomorphic variant. 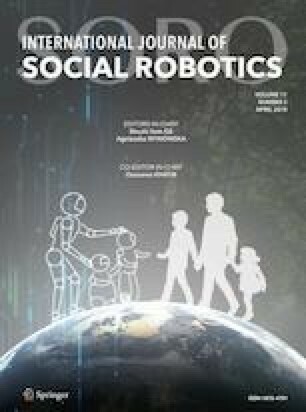 Importantly, this effect was found to be symmetric, with trust in anthropomorphic robots reduced if participants had previously interacted with a less human-like variant. These results showed that we generalise our initial attributions across agent categories, a finding with potential application in helping trust and acceptance of complex technological agents. This material is based upon work supported by the Air Force Office of Scientific Research, Air Force Materiel Command, USAF under Award No. FA9550-15-1-0025. This study was funded by by the Air Force Office of Scientific Research, Air Force Materiel Command, USAF under Award No. FA9550-15-1-0025.